The 2014 national champion is Derek Snow (Wakatere BC), in a very close contest won on count back. Second-placed Phil Ash (Manly SC) was on the same points. Both were Veterans. Mark O'Brien (Hamilton YC) in 3rd place was very close. Two breezy races, but mostly light airs. 20 yachts on the start line. The first 6 races were each won by different sailors. Derek Snow's win in the 7th race sealed for him the title that would otherwise have been Phil's. Derek was presented with the Farr Cup by class president John Elliott. The Cup was first presented by Bruce Farr in 1974. The inaugural winner of the Cup in 1974 was Phil Nicholls (63) and he came out of retirement to sail very well in this contest (placing 3rd in the 6th race) – the 40th anniversary of that first win. His presence was a nice reminder of our history, and it was still good fun too. The 2014 contest was typical of recent years in having 20 yachts, and in the youngest sailor just out of Starlings being 15 years old, while the oldest sailor was 69. It highlights the wide appeal of the class for 60kg to 80kg sailors; regardless of age and regardless of support from YNZ. Add to that a fast and exciting boat, learning to trapeze on a skiff reaching, plus all the aspects of trimming and depowering a tall fully battened rig with vang sheeting to suit different winds. All this in yachts that cost the same or less than a competitive Starling, but go considerably faster. The boats have great longevity, Derek won on yacht #88. That yacht was actually built for Bruce Farr in 1974 by Charlie Webley, and Bruce Farr then used it to win his own cup in the 1975 National Championship! This is a testament to the design of a light hull, still at minimum weight, requiring low maintenance that more modern yachts have yet to surpass. Find a Laser or 470 that is still competitive after 40 years! There was one breakage in the contest. Manly local Mike Jones dropped his rig just before the start of the second race with a broken stainless steel strap chainplate. This was quickly replaced with no other damage, and he was back on the water on day #2. With his discard he recovered to 6th overall, 3rd Veteran. For the first year the class introduced extra Veteran Race categories. As well as the Veterans Cup 45yrs+ two new categories were included Grand Veterans 55+yrs and Great Grand Veterans 65+yrs. Derek Snow took both Veteran and Grand Veteran honours, giving new hope to old people everywhere. John Elliot (67) life member and legend took the Great Grand Veteran medal and 7th place overall he also won the first race and continues as class president. Carey Shelley (Richmond YC) won the under 21 division and placed 4th overall. Youngest sailor was Hamish Hall-Smith (French Bay YC), 15yrs old, in his first regatta sailing in the class since graduating from Starlings. A number of well-known names kept the sailing to a very high level including Don Wright (RNZYS) one of Sir Peter Blake's crew from multiple round the world exploits; ex-Great Britain sailing rep Oliver Hawkley (Manly SC) placed 5th overall; there was multiple 3.7 champion Lance O'Connell from Rotorua, and sailing dinghy legend Peter Sharp (BoIYC). The oldest competitor was David Cook (69) from Wellington. Multiple 3.7 Champ Mark O'Brien who is currently the fastest in a breeze (and way ahead on Grand Prix points this season), freely assisted many of the sailors with tips and advice, helping support beginners, and in fact anyone who wanted help. The event was held at Manly Sailing Club in conjunction with the Jollyboat class national championship. 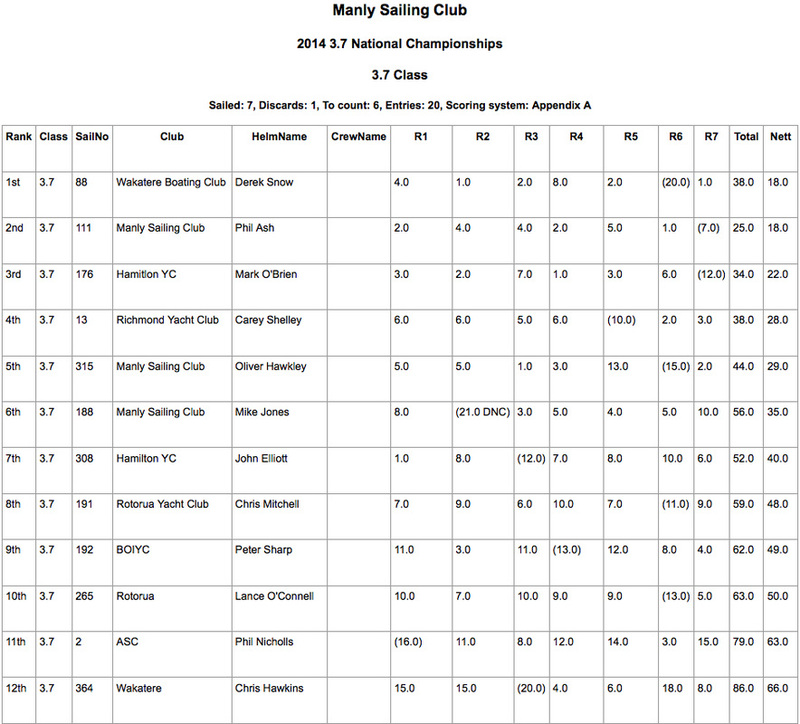 The 3.7 class give huge thanks to the Manly Sailing Club & PRO Kim Admore for a fantastic event and to the Jollyboats for making it so enjoyable too – they have a bunch of legends in that class too.